Iâ€™ve always been a fan of simplicity. As few knobs as possible, killer tone and no frills. While some companies seem to compete in making the most outrageous boutique pedals with more knobs than all your pedals combined, some go all old school and offer nothing but tone. North Effects is one of the latter with a wide range of clones all based on classic effects. Hereâ€™s my review of the 22/7 Violet Ram. The 22/7 Violet Ram is based on a mid 70s model Electro Harmonix Big Muff â€“ the so-called â€œramâ€™s headâ€ (after the ram logo image). 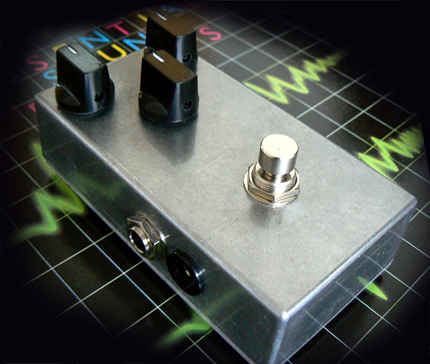 The pedal is housed in a typically dull DYI kit box about the size of a MXR. It features heavy duty Neutrik jacks, Alpha pots and footswitch. It runs on either 9V Boss-style adapter or battery and feature true bypass switching. David Gilmour has since 1976 and the recording of Animals preferred the Ramâ€™s Head Muff for his lead tones. The old Cornish boards featured slightly modified original mid 70s Muffs but he also used the now legendary Cornish P1 â€“ a Muff said to have been cloned after one of Davidâ€™s ramâ€™s heads. The 22/7 Violet Ram has a distinct ramâ€™s head-ish tone with a saturated aggressive gain, fat lows and scooped mids (very little mid range frequency). Ramâ€™s Heads arenâ€™t known for being silent but the 22/7 Ram has surprisingly little hiss and rumble. The pedal goes nicely with both low output vintage style single coils and EMG DG20s and if you prefer the heavier stuff it sounded quite deadly on a pair of Gibson Classic 57 buckers. Iâ€™m using a Fender CIJ â€™62 reissue Telecaster with a custom Cream T Pickups SSL5 bridge pickup into North Effects 22/7 Violet Ram > ThroBak OD Boost > Boss RT20 and a Laney Cub12 15w stack. Reverb and delay is added in Logic. Although Iâ€™m a Triangle Muff fan my self (first Muff model from 1971) the Ramâ€™s Head is a must for those Animals, David Gilmour 1978, The Wall and Final Cut tones. The 22/7 Violet Ram sounds almost identical to my original Electro Harmonix but a little brighter and slightly more aggressive than the BYOC Large Beaver. Perhaps a bit too bright for my taste but it depends on where you want to go. Davidâ€™s Animals tones in particular can be quite spiky. It could do with a more pronounced attack though although this is easily fixed with a nice transparent booster like the ThroBak Overdriveboost. Another drawback is the fact that it doesnâ€™t feature a led. Neither did the old Muffs but I expect that from a clone. The North Effects 22/7 Violet Ram isnâ€™t your typical Delicate Sound of Thunder or PULSE Muff but highly recommended for Davidâ€™s Animals and late 70s tones. A small footprint and a very reasonable price tag makes this an excellent choice for even the tightest budgets. 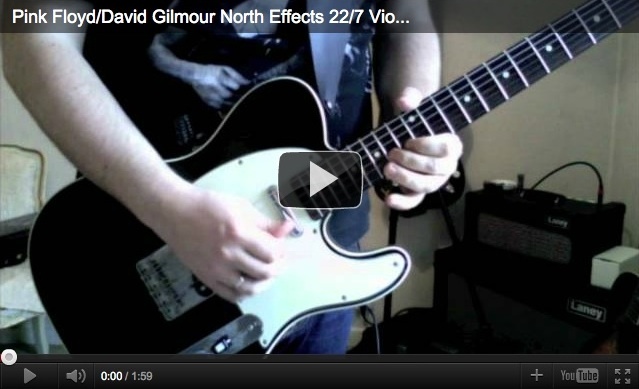 Check out the North Effects store for more classic effects. The 22/7 Violet Ram was tested on two different Stratocasters, one with Fender CS69+Duncan SSL5 (bridge) pickups and one with EMG DG20 pickups, a Telecaster with custom Cream T Pickups SSL5 bridge pickup and two different amps, a Laney Cub12 15w stack and Reeves Custom 50w â€“ both with Weber Thames 80w speakers. I have a Colorsound Overdriver and I play through a Fender Tweed Blues Jr. Would the North Effects Ram’s Head be a good choice for me? I believe it would be. I do love that aggressive sound that David gets in his 70’s – Present tones although I also own an AA Green Russian, should I feel like venturing into 80’s & 90’s Floyd. This seems to be the best option for accuracy and price seeing as how hard it is to find an accurate Violet Ram’s Head clone. I think only like 3? companies make them. Anyway, great review! Hello Bjorn! I just ordered the violet rams head :) Im pretty excited! I have the DG-1 and it is VERY nice sounding but indeed, like you said is hard to get the animals, wall, and final cut tones with. Its possible to get the sound, but I think this Rams Head is going to be exactyly what I needed. I am going to still use the DG-1 though. Most likely have it set up for dry solos and rythms, and have the Violet set up for my flanger! btw you might not remember but I took your advice on getting the Blues Jr. it is plenty loud enough for me in my band and it sounds very nice :) thank you very much for all you help me with! btw, one question, you said the violet is a quiet muff, compared to the DG-1, how quiet is it? Thank you very much! Thank you for answering Bjorn. Do you think the Custom Shop 54 would do well with Violet by North? Could you help me choose a Muff ? I need to buy a model that reproduces the sounds of the era Animals and The Wall, I’ll buy a replica of a Colorsound + RT-20, then buy delay and flanger. My guitar is a Fender American Standard 98 with Custom Shop 54 pickups, and my amp is a Egnater Tweaker 40. What Muff you advise me? thank you !!! Thanks. One more question: Which clone is best for Delicate Sound of Thunder tones? Great review. I actually just got a deal on a 22/7 Red Ram pedal (non-LED model). Haven’t had a chance to test it out yet, but apparently, it is a precise clone of the ’73 Ram’s Head (which is the model Gilmour used until Division Bell, when he switched to a Sovtek). Can’t wait to plug it in. Do you think the Red model would more accurately obtain those tones than the Violet model, for instance? Would you recommend adding anything, like a slight mid-boost EQ or a clean or slightly dirty OD boost? We know that was a difficult question in did, but you felt honest and you are doing your best to answer it. A doubt, I understood that mjm has your musical style a bit more gain, but what would the difference between the pig hoof and north effects? or , Why do you like pig hoof north over effects? We all appreciate your work, you make our passion more easy. I know this is a difficult question for several reasons, you prefer the triangle muff, everyone has a different tastes, the muff ram’s head are triangles muff with other values, etc. For YOU, at your own tastes and ears, with your setups (reeves and laney), and with all your possible comparisons with differents muff… Wish is the best P1 (Violet Ram’s head Muff) clone you ever try? I recently bought a BD-2 with a Monte Allum mod… I’ve been mainly using it so far as a clean boost for either my fuzz or for my cheap Boss DS-1 which I’m looking to replace with a nice distortion unit. I might look into either a vintage style Big Muff or this Violet Ram if you think my amp can handle it. The tone in your clip is really nice; I see you are using a small 15W stack and and getting a nice sound out of this pedal. Do you think this pedal goes well with smaller setups, or do you have to be cranking the amp to really get the most out of it? I’m playing through a Peavey Classic 30.
hey, just wondering if to get a tone similar to the sound you got on the second solo with the effects, would a phase 90 or and electric mistress work better? Just got my violet the other day for my birthday (after dropping lots of hints) all on the back of your demo. I’ve paired it with a Monte Allums modded TS808 and it is fantastic. Worth mentioning that they must have recently upgraded them as mine had a LED. On a different subject, I have also been looking at a Laney Cub 12r and am very impressed. Have you tried out the Hiwatt T20? I’d love to see you demo that. I believe the great authentic tone you nail for this “Dogs” excerpt is achieved by the RT-20 (among delay and reverb, which have no “tone” themselves basically). I have a Boss GT-Pro modeller….surely a kind of wonder-box, but it does not really allow to combine it with a chain of classic pedals in front or behind it….sometimes I miss such an old school classic pedal train. Nevertheless I would try the RT-20 to be added to my sound…..so I wonder wether you can tell if the RT-20 is suitable to be put into a loop? My GT-Pro has a stereo loop send and stereo loop return. Within the virtual effect chain I can set the Loop whereever I want…so in this case best in front of my virtual pre-amp/amp-simulation, or behind it along with reverb and delay in the end? Also the GT-Pro has a fixed “pre-loop” which is in fact a fixed “first in chain in front of the GT-Pro in total ” loop…but it is only mono. Question: does the magic of the RT-20 only show up in stereo usage? Bjorn, another question about the RT-20. Does it alter the guitar signal when the effect is low within the mix (setting the mix control low)? Or is the signal converted; like AD / DA? I’m very curious about this pedals! I went to the site and they’ve a great stock of different muffs: triangle, ram’s head, civil war and the violet (that you you showed us here)! Another good thing I liked was the “no paint theory” and the simplicity of the knobs. That’s the way I like to work live! The stuff used inside is fairy good. The price is fair and give us more sound quality than many others out there! I’m getting an urge to buy one! Thank you! Sorry I didn’t explain myself very well above! What I meant, is your clean tone on stage as loud (or close to as loud) as your muff or overdriven volume? Or do you set your muffs to boost both gain (distortion) and overall output volume so it is louder too? From looking at your settings (OCD for example) in my rig setting it like that would boost the volume considerably and this prevent me from playing clean and (as loud) as my overdriven signal. Thank you for sharing the RT 20 settings , you catch the Yamaha RA 200 ressonance very well . the sound is very pleasantly liquidy. Usually I get this ressonance only with the direct level at 10:00. but it undermines the original signal. I think the secret is your tube amp. For example, in his video “David Gilmour – So Far Away,” you seem to use the same settings in RT -20, but this seems less liquid, it was because of the solid state marshall? A quick semi-related question. I notice that your overdrive pedals are often set for a volume boost as well as a “dirt” pedal. Is your clean tone much quieter than your drive tones? On their website they have two Ram’s heads, one red and violet, are you using the red one? is bright and wild, another great HamÂ´s Head option. The tone with the RT 20 is simply fantastic. what settings on the Boss Rt 20? This sound really because I prefer the “triangle” I would like to buy the 22/ Triangle have you try it ? Great articles as always.Bjorn could you tell me what was your setting for the RT-20?